Aruhatala’s Purpose: What Do I Do? And Why Am I Helping You? Heart Wisdom – Who is Aruhatala? 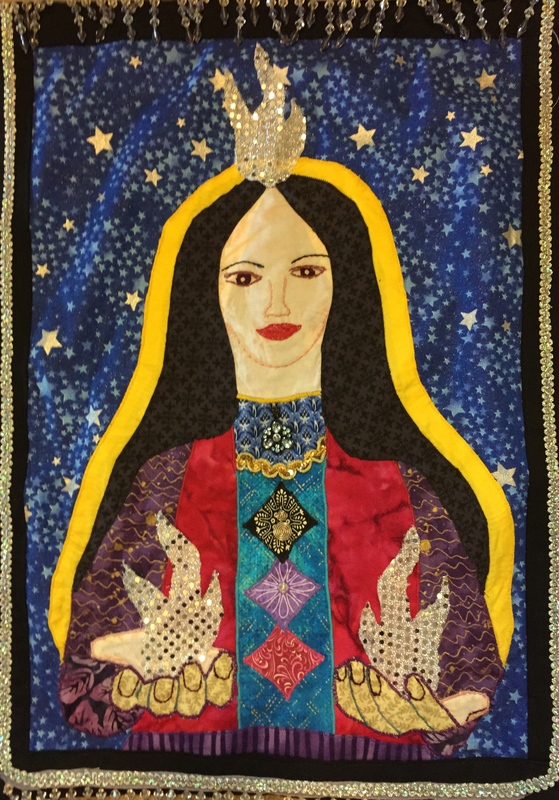 This is an applique I created that gives you a sense of Aruhatala–her beauty, love, and the White Christed Light coming through her and out her hands. Aruhatala of Telos, a woman from the Fifth Dimension, would like to help us release our distortions (blocks, traumas, personal patterns), and move toward our personal and planetary evolvement and ascension—and all done in a loving, heart focused way. To that end, she came through me to work with people, giving them tools and exercises to break free of their distortions and blocks. Much of the information contained in this book is new—and her perspective is loving and supportive. The information is accessible and the exercises very easy to do–and the results can be profound. Her book is Heart Wisdom. For sample chapters, click here, here, and here. You can listen to a number of her channelings here. Aruhatala always starts the sessions by running the White Christed Light through her to everyone who wants to receive it. This is a very wonderful healing and transforming meditation. You can hear several of them right here.